June 16, 2018. Riga, Latvia – Yesterday, a short flight over the Baltic Sea brought His Holiness the Dalai Lama to Latvia. He was welcomed at Riga Airport by the local Latvian and Russian organizers of his visit. A large group of well-wishers were waiting to greet him at his hotel—he smiled, waved and shook hands with as many of them as he could. This morning at the Skonto Hall, which is once again the teaching venue, His Holiness first met with more than 40 members of the media gathered in an anteroom. After making a very brief statement, His Holiness took their questions. “I feel that competition that results in everyone involved reaching the top can be regarded as healthy and positive. However, if it entails putting obstacles in your rivals’ way, it’s not so good. 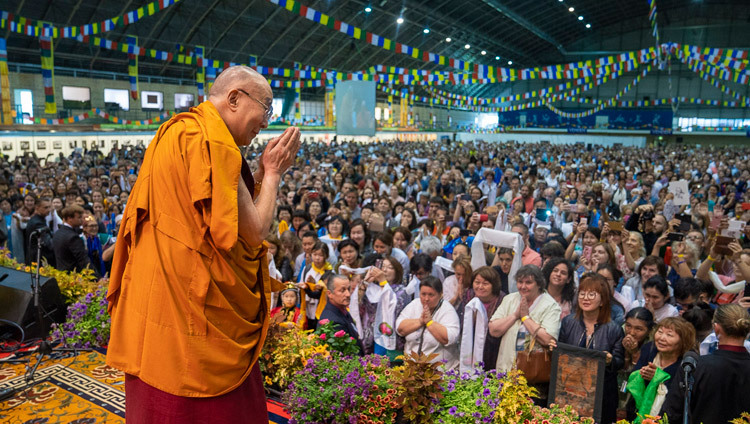 As His Holiness took the stage in the larger hall, a capacity crowd of 4000 people took to their feet, cheering and waving silk scarves in welcome. The ‘Heart Sutra’ was recited in Latvian. “I am very happy to be here once more in Riga,” His Holiness began. “It seems that many people from the Russian Republics have also come. We are all followers of the same Nalanda Tradition, so I feel it is my duty to explain it to you. His Holiness explained that a key element of the Nalanda Tradition, which has been kept alive in Tibetan Buddhism, is its use of logic and reason. This approach was introduced to Tibetans by the great Nalanda Master Shantarakshita, who was invited to the Land of Snows by the Tibetan emperor in the 8th century. “We develop destructive emotions such as anger and attachment on the basis of ignorance. To counter that the Buddha spoke of the Two Truths—conventional and ultimate truth. He pointed out the gap between appearance and reality. Different Buddhist schools of thought present different interpretations of the Two Truths, but Nagarjuna taught that we will only eliminate fundamental ignorance by coming to understand emptiness of intrinsic existence in the context of dependent origination—the notion that things only exist in dependence on other factors. 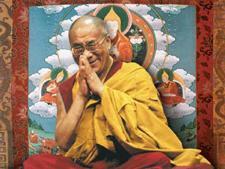 The first text from which His Holiness began to read was the ‘Diamond Cutter Sutra’. Before completing that, he switched to Je Tsongkhapa’s ‘In Praise of Dependent Origination’, which he read to the end. His Holiness had lunch with a group of invited guests before returning to his hotel. The teachings will resume tomorrow.